Chief executives from leading publishing houses around the world, including Markus Dohle of Penguin Random House, Carolyn Reidy of Simon & Schuster and Arnaud Nourry of Hachette Livre, have said they are “deeply concerned” about the closure of 29 publishing houses in Turkey and called on president Tayyip Erdogan to protect writers’ freedom of expression. The Turkish government shut down 29 publishers under state of emergency regulations last month in reaction to a failed coup in the country, according to the Turkish Publishers Association (TPA), which condemned the closures as “an assault on parliamentary democracy, the government and the people”. 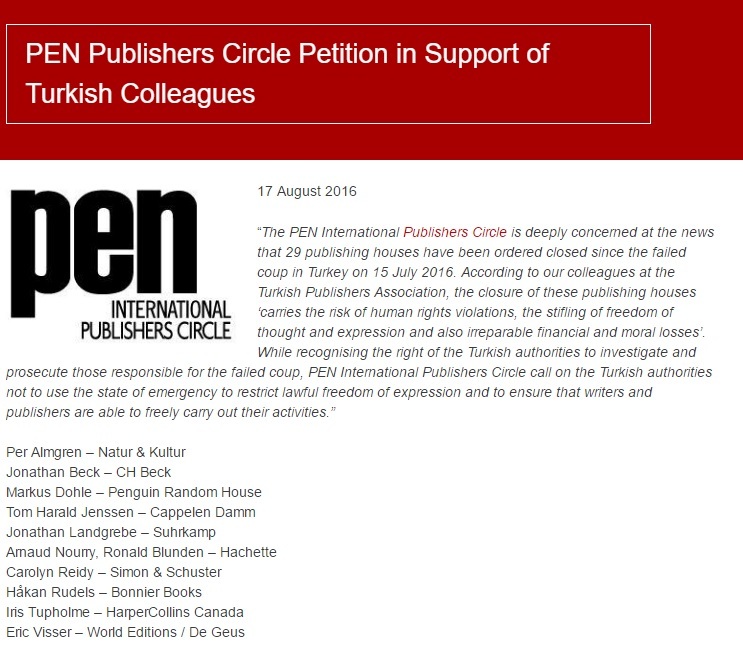 PEN International Publishers Circle has now organised a petition against the crackdown, which urges the Turkish authorities to stop using state of emergency regulations to restrict “lawful freedom of expression”. The publishing chiefs said: “The PEN International Publishers Circle is deeply concerned at the news that 29 publishing houses have been ordered closed since the failed coup in Turkey on 15th July 2016. According to our colleagues at the Turkish Publishers Association, the closure of these publishing houses ‘carries the risk of human rights violations, the stifling of freedom of thought and expression and also irreparable financial and moral losses’. The statement authored by the PEN International Publishers Circle – a group of publishers committed to promoting “free expression, literature and intellectual collaboration” – has been made available to view on PEN International’s website here, and will be sent to the Turkish authorities and widely circulated by PEN Turkey. The passionate defence of freedom of expression in Turkey comes at the same time as PEN Turkey is set to receive the Turkish Journalists’ Association’s (TGC) annual “Press Freedom Prize” in Istanbul this evening (18th August) for “the unique solidarity unparalleled in the past […] showed against the assaults on press freedom in Turkey, for efforts to bring to international platforms the violation of rights and for instilling in their Turkish colleagues the feeling that they are not alone”.